Billy Gibbons has cancelled his disastrous Australian tour and dragged his sorry arse back to the USA but maybe this isn’t all his fault. In fact, it isn’t. Gibbons Australian shows have been a complete embarrassment but only because what the public was sold appears to be something totally different to what the ZZ Top legend thought he was meant to be doing. Gibbons was on stage for 15 minutes at Anita’s Theatre in Wollongong and played three songs on the first night and four on the second. He wasn’t so lucky in Newcastle. Fans started pelting him with whatever they had during his third song. He only got two and a half songs into that set before basically re-enacting the chicken wire scene from Blues Brothers unintentionally. One final show in Brisbane on Friday has been cancelled to avoid a re-enactment of the Blues Brothers Carrie Fisher scene. The problem with this tour actually isn’t Gibbons or the people who brought him out but how it was sold to the public. Noise11 understands that potential “buyers” of the show (the venues) were sold “a Q&A with a couple of songs.” To that point, Gibbons gave the audience what he was told he was meant to give. The problem is that this whole debacle doesn’t seem to be contractually documented too well. In a normal agreement, the venue would have a minimum time the artist had agreed to play written into the agreement. From what Noise11 understands, this whole tour was a mates agreement and a couple of handshakes. Gibbons is in Australia “for a mate” doing something he is passionate about – talking about hot rods. While the Q&A revolved around hot rods, that wasn’t Billy’s fault. That is what Billy was brought out for. Somewhere between a Texan guitar legend jumping on a plane to travel to the other side of the world to talk about hot rods and strum a few chords this thing became “Billy’s Up Close & Personal Show consists of intimate life stories, while kicking back with Billy as he plays and reflects on some of his favorite tunes and famous riffs. “To perform some of his greatest hits Billy will be joined by his Australian band the Billy T’Zz. Also accompanying Billy will be his long time friend, Hot Rod guru Jimmy Shine, as they share their “Rock and Rod” stories”. So, 15 minutes on stage … yeah we’ll accept that as a rip-off. As for the content of the show, it was what it was. Let the buyer beware. 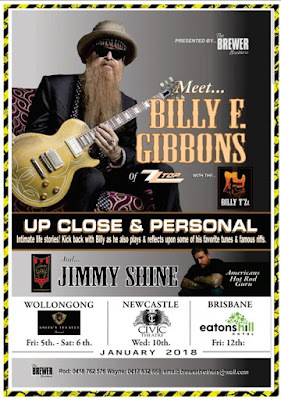 This doesn’t end well for Billy Gibbons and sadly it will impact on ZZ Top every touring Australia again. Audience expectations regarding Billy Gibbons' role as a performing musician in the recent Up Close & Personal dates through Australia seem not to have been in line with what he was asked to do when his services were engaged last year. Mr. Gibbons was contracted to appear on those dates to discuss his passion for custom cars and hot rods with Jimmy Shine and to sign autographs and greet fans with no musical component called for or anticipated in the arrangement. It should be noted that, based on that understanding, he didn’t even bring, nor did he request musical equipment appropriate to such a performance. It appears that these dates were promoted in such a way as miscommunicate to ticket holders that a substantial musical performance would be part of these events. Billy Gibbons, ever the consummate professional, had not planned nor prepared that kind of program and regrets that his role in those dates appears to him been grossly misstated. Billy was not pelted,he left the stage pissed off with the Band(they couldn't play in the key he wanted )and he wasn't impressed with the out of tune guitar he was playing, and get this clear, he left the stage on his own accord, viewed by a stunned audience, the MC came on stage and announced Billy would come back to sit on the Lounge and answer audience questions,Billy apparently was not agreeable and the MC announced the concert over ,and that is where the trouble started .